Chief Ashkenazic Rabbi says Sabbath is being violated in Ashdod and elsewhere in Israel. 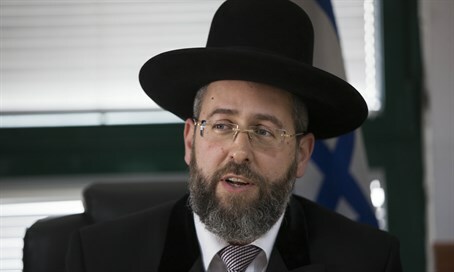 Rabbi David Lau, the Chief Ashkenazic Rabbi, said Monday that he was extremely upset by the fact that the Sabbath is being violated in public, in Jerusalem, Ashdod, and elsewhere in Israel. The rabbi's announcement opened a session of the Chief Rabbinate Council. He was referring to the opening of a new “Yes Planet” cinema house in Jerusalem, which will operate on Sabbaths, as well as the Big shopping complex in Ashdod and other shopping centers, which operate on Shabbat. "The Sabbath is important to all the Jewish people, and we are horrified to learn that it has been violated in many places in Israel,” he said. "We call upon all of the heads of the public to make a great effort for the honor of the Sabbath,” he added. Jerusalem Mayor Nir Barkat is set to stop the Sabbath operations of eight minimarkets in central Jerusalem, and secular city councilors said that this is part of a tradeoff Barkat has made with haredi councilors, according to which they will countenance the opening of the Yes Planet movie theater on Sabbaths. The affected minimarkets are located between Shivtei Yisrael, Keren Hayesod and Agrippas streets. The opening of the new movie theater on Sabbaths aroused opposition among a very wide swathe of the religious and haredi public in Jerusalem, from the extremist-haredi Eida Hareidit, which organized a protest outside the cinema, to religious Zionist councilors who also protested the move. The haredi councilors in the Jerusalem Municipality are not assuaged by Barkat's plan to enforce Shabbat laws against the minimarkets. In a letter to the city's legal adviser, Attorney Eli Malka, the haredi councilors wrote that they do not understand where Malka and Barkat got the notion that they can selectively enforce the law in different parts of the city.